I was looking forward for this weekend for two reasons. I want to break my unproductivity and I allowed myself to be bothered by some insignificant nuisance Admittedly, ignoring insignificant incidents is not one of my strengths. Allowing myself to become easily affected is one of my undesired talents. However, experiences like this never fail to give me some unexpected learning opportunities. For one, I encountered another case when maturity does not come with age. Some choose to plant hatred, even among silent and innocent individuals. Hate seems to be a superiority indicator for some. I don't know, but I noticed some individuals seem to feel empowered whenever they have an opportunity to express it. An unfortunate reality or irony, people expected to wear the shoes of maturity become living evidences of this immaturity. Focusing on the good side, I'm thankful for this long weekend. The quick holiday break started for me last Friday. I had a sumptuous Korean meal with my friend A. I treated myself to more sleeping hours. I'm starting to regain my interest in reading. I wanted to finish another Korean drama but my obese and aging body is always calling me to sleep. On the few hours I'm awake, I watch The Voice with my family, while enjoying a bottle of Coke and a bag of potato chips. This has been my definition of peace and tranquility lately. Everything seems to feel right whenever I'm with them. In between, I check my social media accounts and entertain myself with valuable items in my newsfeed. Here are some interesting reads from my social media accounts. KFC's search for Goblin's wife lookalike - Several days ago, a netizen noticed a KFC crew who has resemblance with the popular Korean actor, Gong Yoo. I guess the company took advantage of the opportunity. There's a sudden advertising campaign formulated. Unless otherwise, everything has been planned from the start. An insightful read for HR professionals, managers and rank and file employees - Times are changing, there's always a better way to do everything. I hope the points raised in this article warrants some attention... and action. This Facebook Community Summit - So much to learn and realize after watching this video. Never knew the power of Facebook groups. I was also amazed by the fact that Facebook is engaged in research based and customer empowering activities. Here are more beautiful things that made the past week in photos. My weekly planner mess - My current sources of happiness are stickers, sticky notes and more paper products. Discovered this inspiring planner from Mother E! - The 100 Bucket List will make it as one of my favorite items for 2017. For those interested, I discovered some sellers from Ali Express offering it for a cheaper price. Thank you Terra and Marieken for the postcards and wonderful messages. On usual weekends, I'm always rushing whenever Sunday arrives. I love that this time, I'm able to take things slow and my exposure towards negative people are lessened. :p No matter how much I rant, I can never get rid of them. #Fact #Reality Whatever it is, I just hope that I emerge as the better person after everything. Can't wait for the day when I reread this post and realize a lot has changed. I will eventually laugh about everything. There will surely be better days ahead. I'm typing this post at 2:35 am. I started three hours ago and thought I was halfway done. 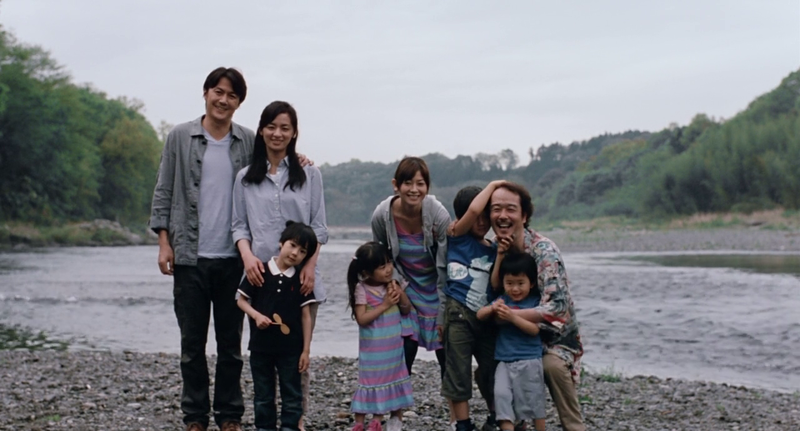 Somewhere along the way and my grumbling stomach, I decided to change everything. I sounded too preachy. I felt like I was writing a pretentious reflection paper. :p Well, I have the same sentiment in some of my old posts. I cringe when I reread them. I think I've written so much boring and serious thoughts. Let me lighten up by sharing some photos from the past week. Weekly Planner Mess and a reminder to enjoy all the little things, which I did for this weekend - I had enough sleep, TV series marathon, and some great food at home. Speaking of great food, I had a lot this week. In effect, my weekly exercise marathon became useless. My Beatrix Potter's book collection is alive again. I wish to complete the 23 books in this green hardbound edition. I was lucky to score some copies from Book Sale and a few sellers via Instagram. Please help me complete my collection, tag me or email me stores that offer this vintage edition. And here's another vintage book I scored this week, Guess How Much I Love You is a perfect father's day book. Recently, I often visit the children's book section of bookstores. There's something about children's books that can unearth and captivate the kid-at-heart of every grown up. I also feel that children's book are more challenging to write. (Consider this as one of my ultimate life goals now.) My recent favorites include The Day the Crayons Quit, Missing Mommy and The Heart and the Bottle. Thankful for having a Dad who supported all my endeavors. Unfortunately, I failed to upload this post on a Sunday. :( In a few more hours, I'm back to work again. I hope this week brings me something great to look forward. I maybe rattled again. I'm hoping that some sources of happiness will come along the way. My friends and the Big Boss above know how to make it happen. ;) Insert one of my life's current OSTs. While the past week has not been so good, the weekend made up for everything. I spent the entire Saturday in BGC. I meet up with my friend A, we had chicken wings from Wing Stop, tried Tim Hortons for the first time, and supported Mother E and her company's book launch. BGC is a great place. Unfortunately, the Manila girl in me feels intimidated whenever I visit places like Ayala Avenue and BGC. The towers, luxurious cars, high rise residences, boutiques of signature brands make me feel that I'm not in the Philippines. :p It also doesn't help that I still can't navigate the entire area. However, I appreciate the open spaces, parks, trees and pedestrian friendly streets. So I guess getting lost in BGC may not be a bad idea after all. Meanwhile, here are the other beautiful things that happened last week. Bidding farewell to my current favorite pair of shoes - Next week, I'm back to my office uniform again. I have to wear the same clothes for 10 months. I will surely miss my comfiest jeans, shirt and everything laid back. I'm developing deeper appreciation for non-fiction books, even though some principles don't work for me. I just enjoy reading varied and interesting point of views. Big thanks to my friend A for this beep card (train card)! Wonder Woman is love!!! My lifetime and grown up mantra :D - Read books, sleep more, and laugh so hard. If these three happen in one day, then I'm all done and thankful. 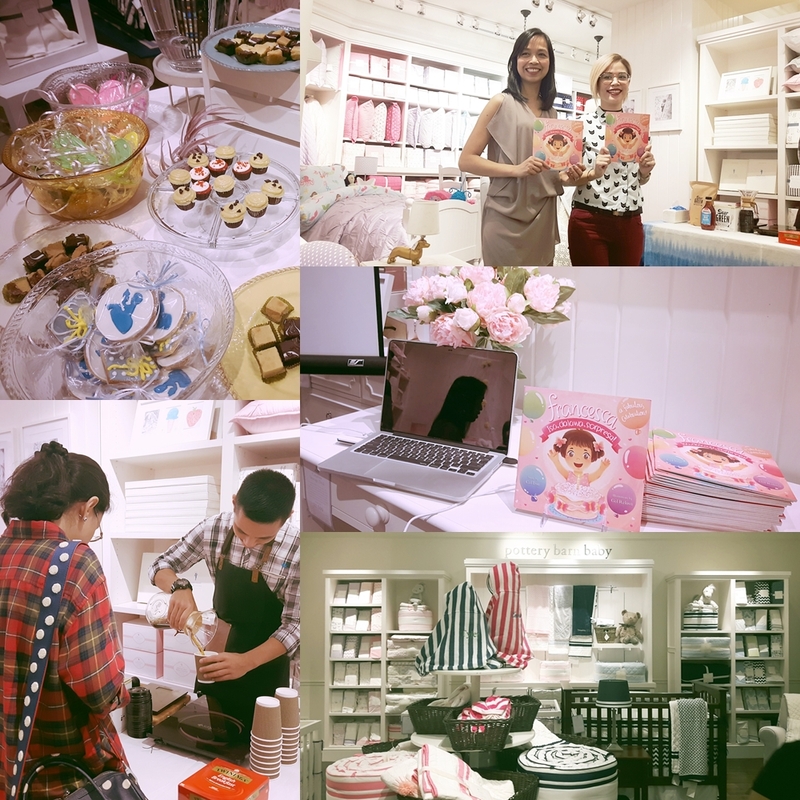 Snippets from Philip & Ana's book launch for Francesca, Isa, Dalawa Sorpresa - Thank you for the invite Mother E! It was my first time to see Pottery Barn, whose kids and baby section interest me than the living room showcase. I later realized this was the first event I attended as a blogger. I wanted to end this post on a positive note. I recently watched a TedTalk that deals with achievements. While everything sounds so inspiring, the actual work depends on the path that needs to be constructed. Added to this, the roadblocks that never fail to get in the way. While there is always a way to surpass everything, I'm also concerned with a common yet least discussed pitfall. When people lose or become confused with their ambitions. I'm a guilty soul here. So much in my list, tried to simplify everything, and ending to be confused, frustrated and become a failure at the end of the day. Life and its never ending complexities. I guess, I'm beginning to sound non-sense here. :) Apologies, but my mind is occupied with scattered thoughts. I probably need some redirection, another inspiration or just some point of relaxation. Wishing everyone a great week ahead! And for my Filipino friends, enjoy the long weekend!!! Postcards from Terra - They all arrived on the same week. Thank you Terra!!! You words always inspire me. I have always been fascinated with subscription boxes. I love the idea of receiving a box of surprise goodies every month. The first subscription boxes I encountered contained Korean based beauty products. Over time, I noticed the growing variety from clothing, food and accessories. Recently, I discovered a Japan based subscription box. It was one of the random ads that appear in my Facebook newsfeed. I rarely click ads, except when the product featured interests me. I first saw Tokyo Treat's subscription boxes. Upon, browsing its website, I discovered its affiliate brand, YumeTwins. While Tokyo Treat compiles packed snacks, YumeTwins deals with everything kawaii. Kids at heart who love Japanese toys, stationery, and other knick knacks will love YumeTwins. I wanted to try both Tokyo Treat and YumeTwins. While reading all the information in the website, I discovered that both brands provide an opportunity for bloggers. Those who wish to receive a free box for review can submit their application via email. You can secure the details here. Fortunately, my request was granted. I was qualified for the May subscription box. The only downside, the box arrived on the last day of May. :p I even have to make follow up visits in the Post Office. Nevertheless, I'm still happy that everything arrived. 2. Rilakkumma New Year Mochi - Yes, it's an edible Rilakkuma. What I thought as a library bell turned out to be two pieces of mochi. 3. Rilakkuma Shampoo Bottle - Another Rilakkuma item :) I plan to place my favorite body wash in this kawaii bottle. 4. Tsum Tsum Cosmetic Pouch- Sheer cuteness! It's a Japan licensed item so this can't be purchased from any other store. 6. YumeTwins Monthly Magazine - Even the magazine is kawaii. It features the monthly products, and updates of future boxes. Overall, I was happy with the first subscription box I received. I kept some of the items for myself and the rest was shared to my niece. For those who are interested, visit YumeTwins website here. They ship worldwide and best about everything, it's free. Order your first box and get ready to be surprised with everything kawaii. 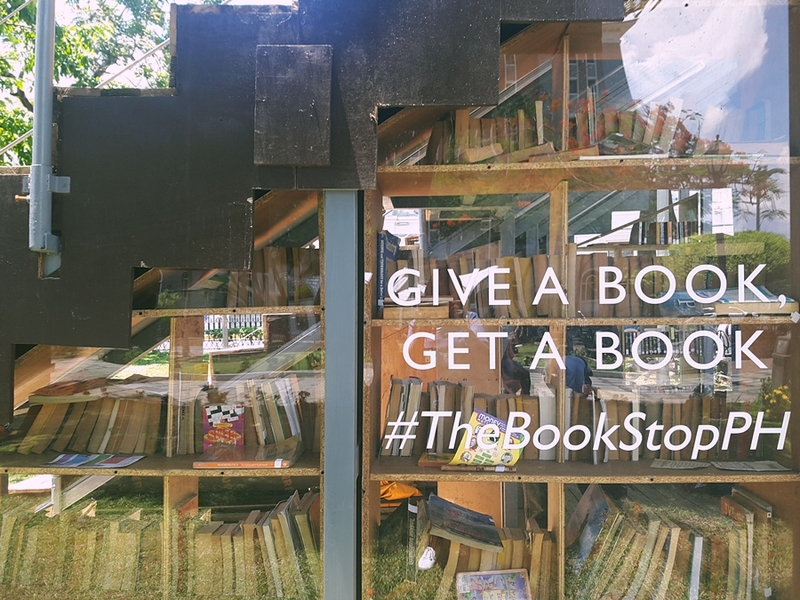 It was during the summer of 2016 when I discovered The Book Stop Project. I love books and libraries so anything that imbibe such concept will appeal to me. 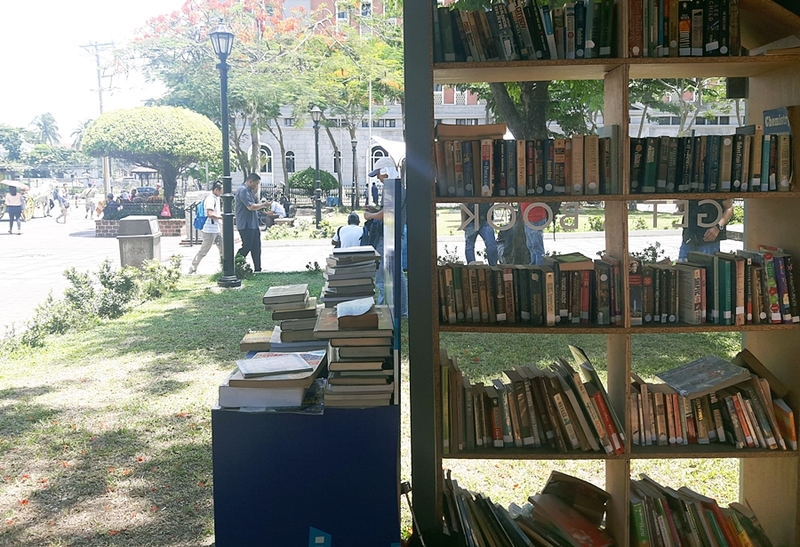 Last year, Intramuros became one of the destinations of The Book Stop Project. Check out my post here. After several months, The Book Stop Project traveled to other places. 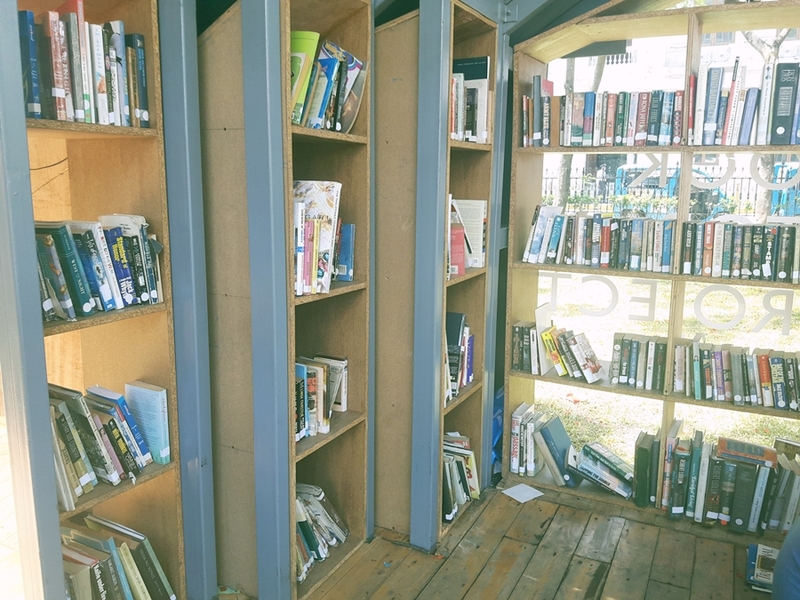 Fast forward to 2017, the structure of the mobile library was given a major improvement. 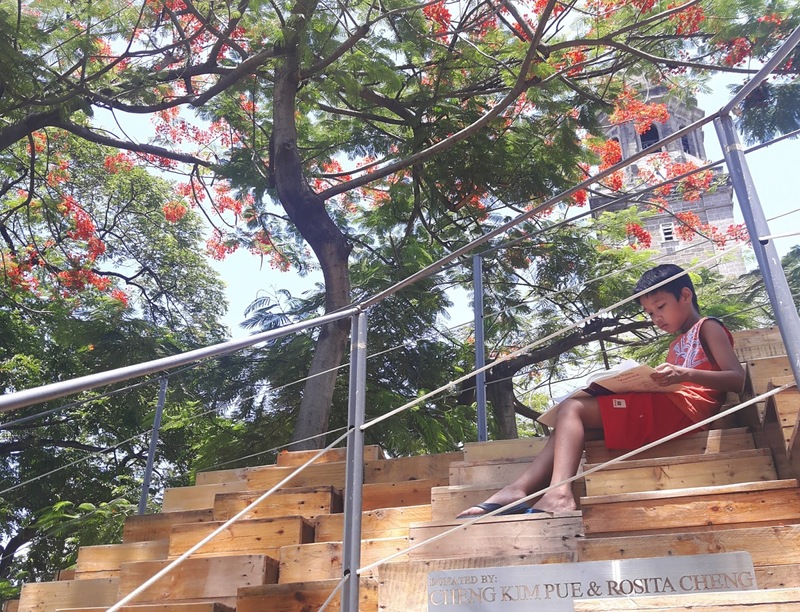 The roof of the mobile library has wooden bleachers that provided ample and comfortable space for reading. 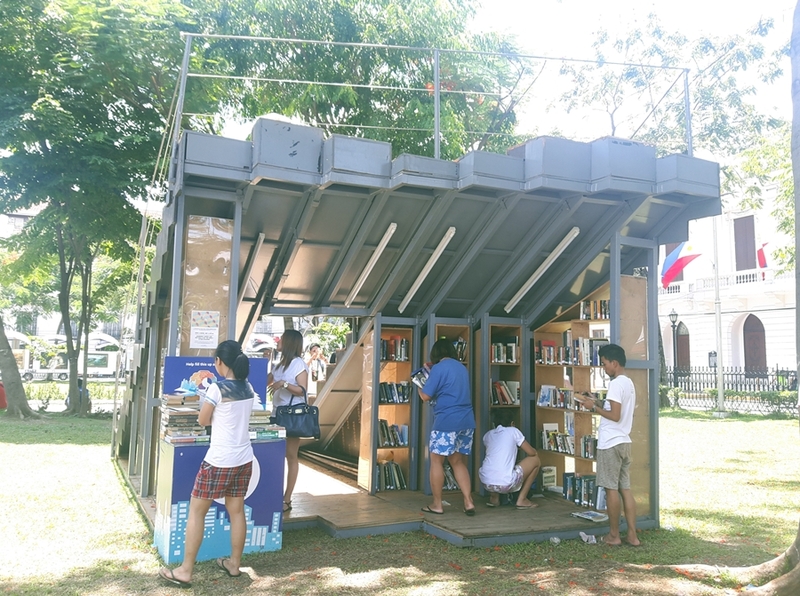 Kudos to the people behind WTA Architecture for always thinking out of the box and believing that libraries remain as partners for creativity and invention. 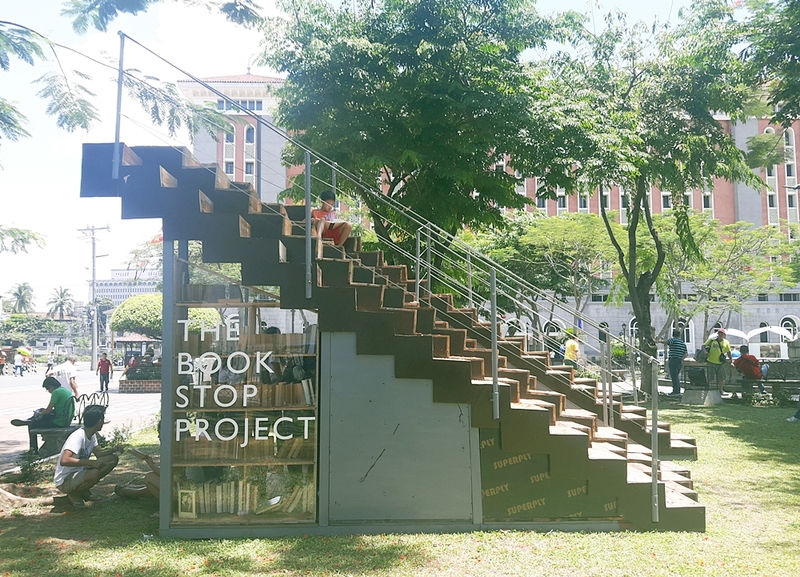 In my biased opinion, Plaza de Roma is still the best venue for The Book Stop Project. I love that there's a library in the middle of a spacious park and the historical structures in the backdrop. 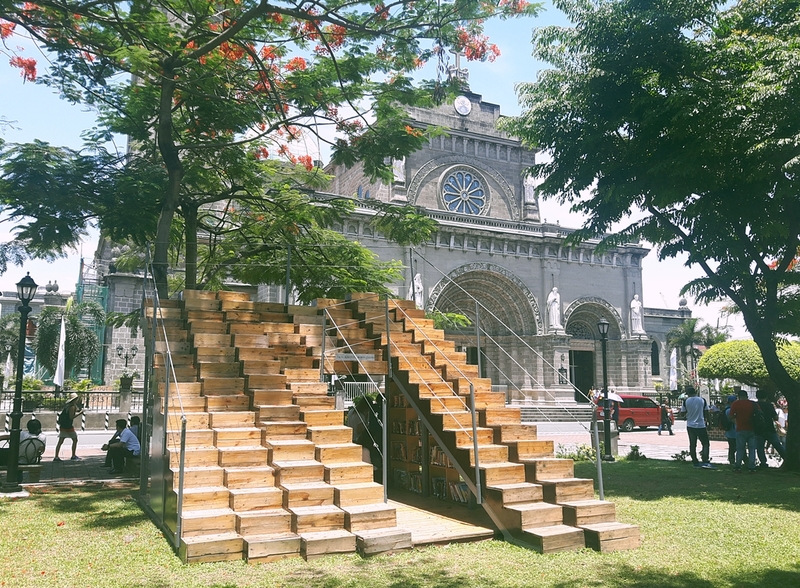 The Book Stop Project will remain in Intramuros until July 22, 2017. I encourage everyone to participate in the book donation or exchange project. Leave your books in exchange for other books. Better yet, donate than accumulate. A book you haven't read for years surely deserves another hungry reader. I also noticed the regular presence of children to teenagers. Unfortunately, the library does not seem to have enough books for this age group. I urge everyone to take this opportunity to donate books for young readers. Although the library welcomes any type of book you can leave. 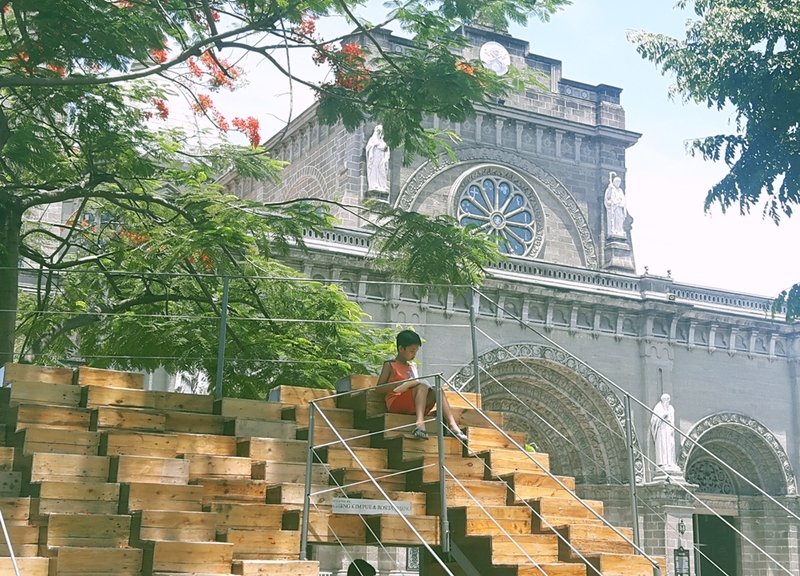 If Intramuros is far and inconvenient from your end, I can offer a little assistance. You can ship the books to my Manila address and I can leave the books for you. Just send me an email dianewrites15(at)gmail(dot)com.